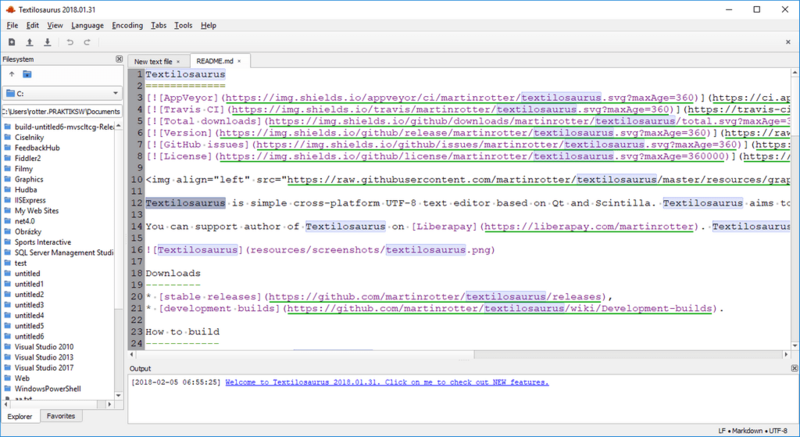 Textosaurus (formerly Textilosaurus) is a Scintilla-based text editor with a configurable, tabbed interface and syntax highlighting. The program includes uploaders, tools for scripting, XML, JSON, MIME and supports a wide variety of text encoding. How to extract: Download the 7Z package and extract (using a program like PeaExtractor) to a folder of your choice. Launch textosaurus.exe. I am glad that the developer switched to a better versioning scheme. Well, you're right - my system is not up to date and I am not able to install the update, because my Win 8.1 is one of those that refused to install the big ("8.2") update. No problem, for most other users Textilosaurus will work fine. So it seems that your operating system is not fully up-to-date. These DLLs cannot be re-distributed with textilosaurus.exe, the only way for me could be to package runtime installers into Textilosaurus installer, but that is not really good because some users install portable Textilosaurus from zip package instead, thus, this is not a solution for them. What do you think? I thought I could use different toolchain (mingw) to build the app for windows, but unfortunately, it is only available for x86 platform which is bad, since I prefer to deploy x64 binaries. You are probably right, it seems that some files could be missing, I will try to fix. Thank you. OK, let me check, bro. This ist (at my knowledge) part of the VC++2015 redist. and sadly required by more and more applications. I only have VC++2010 on my machine. zorro: How did you make such an observation?